More Grand Assumptions: Picnic in the park anyone? 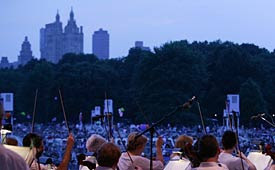 Tomorrow evening, at 8 pm, one of NYC's greatest summer traditions of free music in Central Park will take place once again. The New York Philharmonic is doing a free concert on the Great Lawn, and I'm sooooooooo going. Want to join me? They're playing a series of Aaron Copland songs, and then the real treat: Mahler's Symphony No. 1. Killer!!! We can bring food, and even wine and beer are tolerated at these events (as long as we're discrete about it). It should even be possible to enjoy a few herbal delights, if we get a good spot. Getting a good spot involves getting there early. I'm thinking of getting myself situated sometime around 5:30 or 6 pm. Then the show starts at 8, goes to 9:30, and is followed by a short fireworks display. FUN, FUN, FUN! And then it's only 10 pm... the evening is so young still at that point and NY is our oyster. Who's down? Email me back a.s.a.p. if you want to come, and at what time. I'll figure out a good rendezvous spot for the first wave, and then msg everyone about the final spot once we've chosen it. Email me, or call me, if you're coming along!